The VoiceBud® VB20 Hearing Device is offered with dual-microphone and smartphone app with NoiseBlocker™ technology. The device’s multi-layer noise reduction minimizes sounds from air conditioners and traffic. The unit offers a maximum gain of 25-30 dB and input noise of less than 20 dB. The unit comes in 7.75 x 4.375 x 5.27 in. shipping carton size. The product quickly detects loud noise and automatically turns down the volume for preventing too-loud sounds. SWAMPSCOTT, MASS. (PRWEB) DECEMBER 18, 2018 - ZVOX Audio, the premium audio brand turned hearing company, has disrupted and redefined the affordable personal hearing device category with the VoiceBud® VB20 – the world’s first personal hearing device with dual-microphone and smartphone app for under $300. Designed for people who have trouble understanding voices in some circumstances, the VB20 features a combination of advanced technologies that currently cannot be found in devices selling for less than $800. The VB20 is available at an MSRP of $299.99. A number of affordable hearing devices have been introduced in the last few months – but this is something completely different. 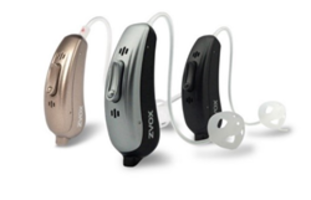 Although priced like single-microphone hearing devices without wireless app control, the VB20 is FDA registered, and offers an impressive array of features normally found in significantly higher-priced devices. NoiseBlocker™ technology is designed for crowded rooms and restaurants – to help the listener hear the people she or he is talking to, and reduce the volume of other people in the room. A dual-microphone system feeds sounds into a sophisticated digital processor that can be programmed to reduce sounds coming from behind the listener. The VoiceBud app control is available for use on iOS or Android phones and tablets. It allows the user to wirelessly control volume, listening mode (four choices – normal, noisy room, automobile and outdoors), bass and treble. It also allows the user to check battery status. Wide Audio Frequency Range: Like other advanced and more expensive hearing devices, the VB20 has very wide audio frequency range, amplifying sounds from 200 Hz to 5.7 kHz – resulting in smooth, natural sound. Ambient Noise Control: A multi-layer noise reduction system automatically detects sounds from air conditioners, fans and car engines – and minimizes those sounds. U.S Made Parts: The electronics components, microphones and transducer in the VB20 are all made in the United States by two of the leading companies in hearing technology. In addition to the performance features above, the VB20 is housed in a tiny (just about one inch long), sleek designer housing available in champagne gold, silver/gray and gray. They are so small that most people never notice when someone is wearing them. They are very comfortable for all-day use – or store them in their slim zippered carry case and throw them in your pocket or purse for when you need a little help hearing. The VoiceBud VB20 is currently available direct from the manufacturer at zvox.com, amazon.com and Walmart.com. $299.99 each. Dual-microphone system with directional processing. App control via Bluetooth from your smartphone or tablet. Wireless Device links hearing aids and Bluetooth phones.